I grew up in a Christian home, sheltered by loving parents. We lived in the city but spent weekends in the country, where my brother and I were free to roam and explore. I loved to read, and started writing some truly awful fiction in my school years. None of those projects made it very far. Sunday School was part of my life from a young age. I always believed in God, but as a child it was a pretty superstitious faith in some ways. You know, giving God all the details in a prayer request, because otherwise He might not “get it right.” Still, I knew He was my source of help. For me the growth has been learning what it means to follow Jesus as Lord of my life as well as Saviour, and discovering more about His character. Playing at writing as a child, and enjoying teacher-assigned short stories in school, showed me I was interested, but university papers and then marriage and a job put it out of my mind. As an at-home mom with a toddler, I joined a local writers’ group and dabbled in some life-experience type essays. Then a fiction idea sprouted and I started writing just to get it out of my head. Novels have been my passion ever since. There are different aspects to that, including, one would hope, some level of earning more than one spends. No matter how many people read our work, or what our bank accounts look like, I think what marks genuine success is this: are we true to our calling as Christians and as individuals? Are we speaking with integrity and love from the heart, with thoughts informed by our faith, with a desire to serve other people rather than to push anything on them? Whether we’re writing news articles, technical pieces, poetry, fiction, songs, notes to shut-ins… the list is endless. Are we using the gifts God has given us in the way He’s leading? In the end, will we hear His “Well done”? Make this one more facet of your life with Christ. Write prayerfully, and cultivate an enjoyment of the process. Don’t be in a hurry to “arrive,” whatever that means for you at this moment. You have talent and interest, but we all need to learn the craft as well. Be diligent, persevere, and grow toward excellence because what you’re writing is for the Lord. Give Him your best. I’ve just completed book 3 in my Redemption’s Edge Christian suspense series, Without Proof, which releases November 10. (NOTE: the Kindle edition is on SALE now until the release on November 10th. Pre-purchase your copy from Amazon and it will be sent to your Kindle on the 10th!) It’s the story of an artist’s assistant who lost her fiancé two years ago in a plane crash – and who now suspects that crash was sabotage. Her questions find no proof – only warnings and threats. It’s shaped the friendships I’ve made, and it definitely shapes what I write. I don’t know if it’s affected career choices or anything like that, but it must have, behind the scenes, because I know God has been shepherding me. What being a Christian has done is keep me from wrecking my life. Faith, prayer, and surrender to the Lord’s care and authority have kept me stable (mostly!) through big and small times of stress. I honestly don’t know where I’d be without that, and I thank God I haven’t had to find out. Writer. Ready. Pen. and The Writer’s Newsletter: Do you Need One? 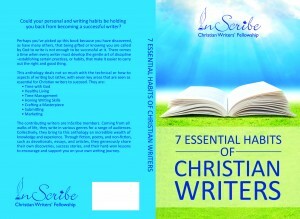 Thanks for hosting me, Ruth, and thanks again for all the behind-the-scenes work that went into preparing the 7 Essential Habits of Christian Writers anthology. I’m proud to be included in it.